ELHistSoc -Indian Mounds & Petroglyphs. This Topic is just being started and will have much more added from time to time. This section of the Upper Ohio Valley is rich in historical lore, much of which is connected with the history of East Liverpool. "Indian Rocks," located about a half mile east of the present city limits, on the north shore of the Ohio River, a short distance east of the north fork of Little Beaver Creek, was for many years the Mecca of pilgrims seeking historical information. Indian Rocks is a flat strata of smooth, hard stone, extending from the bank over one hundred feet under the bed of the river. They could be seen only when the river was very low, and were covered with crude drawings in strange hieroglyphics made by ancient inhabitants, unknown relics of primitive days. One of the first writers to call public attention to the "Indian Rocks" was Rev. Henry C. McCook, pastor of the Chestnut Street Presbyterian Church, Philadelphia, Pa., in his book, "The Latimers," which is a tale of the Western Insurrection in 1794, generally known as the "Whiskey Rebellion." Rev. McCook is a native of Lisbon, this county, and a member of the famous McCook family, noted in the history of the North West Territory and in the Civil War of 1861. The drawings picture warriors with scalp locks and totems hanging around their necks, fishes, birds, turtles, beavers, foot prints of unknown animals, all sketched with crude implements, characterizing rude civilization. The indentations are from one-fourth to one-half inch deep and wide. The running waters and grinding ice for centuries have smoothed down the outlines, but when the photograph of the illustration shown herewith was taken, at low water mark, they were seemingly as sharp and clear as they must have been a hundred years ago. They will never be seen again by the human eye, unless the new wicket dam, No. 8, recently erected by the United States government, at the western end of East Liverpool, should be destroyed and washed away. These rocks are now covered with six feet of water, when the wickets at the dam are lowered. "The Indian Rocks" the petroglyphs of Smiths Ferry"
Many web sites and local blogs mention and post pictures of a local historical site known as the "Indian Rocks". For many years the local tale of ancient rock carvings around the mouth of Beaver Creek has fascinated many people. Most of the early pictures ever published of the mysterious site has been a group of postcards from 1908. The local site is actually located about a mile north of Beaver Creek on the same shoreline of the Ohio. The town that was once there was known as Smiths ferry. A local historian in 1908 from East Liverpool pioneered the research on this site and four others around the East Liverpool and Wellsville areas. His name was Harold Barth. Seventy years later the director of the Carnegie Museum of Natural History James Swauger wrote two major books documenting petroglyph's up and down the Ohio river. It wasn't until these books were published that things really came to light. Swauger used most of Harold Barth's research, drawings, and photographs because they were the only available information known of any of the five sites. Most of the sites have been partially destroyed or covered over by 20 feet of river when the dams were installed on the Ohio. "This big boulder is now under water just off shore near the petroglyphs." The very first mention of the carvings that I could find written came from the tale of the western insurrection of 1794 written by Lisbon's own Rev Henry McCook. The book titled "The Latimers" is a historic novel about Scotch Irish pioneers during the whiskey rebellion. Published in 1898 it gives a description of the Indian Rocks on page 24. It describes carvings of fish, birds, turtles, and human feet. 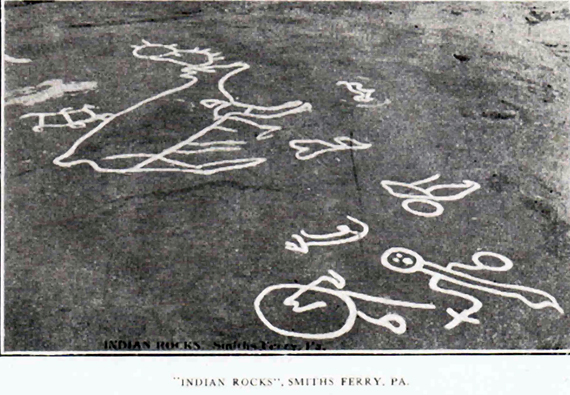 It goes on to suggest that the Smiths Ferry site was held in great reverence by the Mingo Indians as medicine marks. "A carving of a bird and a human with a sword and shield." There are around 96 carvings at the Smiths Ferry site cataloged in Swauger's book. The petroglyphs range from pictures of animals and animal tracks to human images all carved into the massive sandstone shelf that extends out into the Ohio river. The site was well known in the early 1900's. W. J. Holland director of the Carnegie Museum and Theodore A. Mills made plaster castings and photographs of the site in 1902. The cast are located at the museum. The photos were not very clear and were not used by Swauger in his book. The majority of them were scattered and took years to get back from the many different people that had them. "This is an example of how the petroglyphs were advertised back in the day. Local children were dressed up in Indian attire to highlight the ancient carvings." In September of 1907 Father Clifford M. Lewis of Wheeling College West Virginia submitted sketches of the site that he had made. Sketches and notes made by G. L. Ely superintendent of schools New Cumberland West Virginia were donated to Swauger as well. In Ely's notes he remarked that it had been 33 years since the petroglyphs were exposed. That would have been 1874 since they were seen by people. The river had to be under extreme drought conditions for the carvings to be exposed because of the shelf that ran out into the river far from shore. He also noted how the yet to be built dam no 8 in Wellsville would effect the depth of the river forever covering the carvings for good. That would not be the case though because in later years there would be more instances where the ancient carvings would appear.
" This is Harold Barth and a helper exploring the Smiths Ferry site in the winter of 1940." On March 7th 1948 the Cleveland Plain Dealer Pictorial magazine wrote a pretty big article on Barth and other locals including W. H. Vodrey , his son W. H. Vodrey Jr. , Max Gard , and Rev C. F. Kenneweg going out to explore the petroglyphs when the river froze over lowering the water level. The story goes on to explain the many different pictures carved into the stone and notes that they took up nearly three acres worth of space. It also stated that defacements have occurred at the site. Fresh carvings of canoes and a hatchet were made by some ornery boys with a metal chisel. The article went on to tell of the museum on the second floor of the Carnegie Library that Barth was the curator of. By far Barth had the most physical information of all sites up and down the Ohio valley. Everything from photos to facsimiles (imprints done with printers ink) of all carvings. He made detailed notes of descriptions and plaster cast of everything. Swauger on the other hand probably spent more time researching and documenting all of the information from many sources. He made detailed charts of cross reference from hundreds of sites in the region. He also added some explanation of a time frame when the pictures were carved and a general idea of what they were. Many archeologist say the petroglyphs were carved between 1100 and 1700 A.D. Possibly from the mound builders that occupied the Ohio Valley before the native Americans. Others believe that they are more recent attributing them to the native Americans themselves. Lines carved from the heads of the human and animal carvings are believed to represent power or special ability. This was a widely popular theory among past and present archeologist. The museum displayed most of the photos and rolled up imprints of all the local petroglyphs sites. When Barth passed away in 1974 the museum closed up and things were packed away into storage. Most of the pictures taken of Smiths Ferry were in Barth's possession. Whether or not they were actually taken by him has never been determined. As you can see some of the pictures were intended to "sell" the attraction back in the day. Even today most web searches bring up a lot of postcard images from 1908. Almost all of the negatives and pictures of these are in Barth's collection that is stored away. It is not known if the images were sold or given away as a way to promote the Smiths Ferry site. One thing is for sure though without Harold Barth and James Swauger very little information would be known about Smiths ferry. There are pictures that go with these articles. THey will be added in the near future; - ELHS Webmaster. Text and images courtesy of Jeff Langdon. Original Pictures that Jeff photographed courtesy of the Museum of Ceramics, all rights retained and reserved by them. 1) This is an original pencil drawing of Barth's with the actual measurements of one of the carvings at Smiths ferry. 2) 1908 photo of man standing near one of the carvings. 3) A 1908 photo of a lad near a turtle carving at Smiths Ferry. 4) A 1908 photo of Smiths Ferry. It was surprising to see how a lot of the carvings were overlapped over each other through different time periods. 5) A 1908 photo of Smiths Ferry Petroglyphs. 6) A 1940 winter photo of the Smiths Ferry site. Notice how much debris was washed into the area. Barth commented in an interview that he had 8 helpers to help wash and clear the area to expose the carvings. It would have bee a lot of work to expose these things in the cold winter of 1940. 7) Unknown lady at the Smiths Ferry site in 1940. 8) 1940 Smiths Ferry photo. 9 ) 1908 photo of Smiths Ferry. This is a rare one. 11) Another view of Smith Ferry looking down the river in 1940. 12 ) This photo from 1908 depicts a human carving. You can see a name carved in the middle. Even back then graffiti was a problem. 13 ) You notice the initials and the date that it was carved.